Transactions over $3,000 used to trigger customer information to be electronically captured. Per this memo, that parameter has been lowered to $1,000. 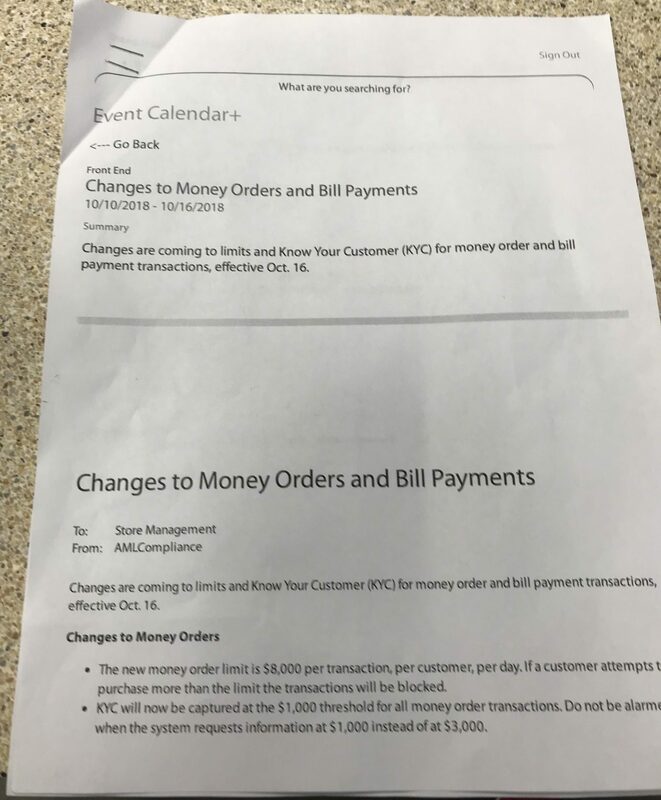 Although customer information capture at $1k wasn’t being completely enforced at all stores after the memo was released, from data points that I’ve received from people in different states, it now appears to be implemented in nearly all stores nationwide. Information capture takes place for any money order over $1k whether that be cash for rent, or multiple debit (gift) cards for points. If I were to guess, if it’s not already fully adopted at all Walmart’s nationwide, I’d expect complete adoption of the $1k rule this month. 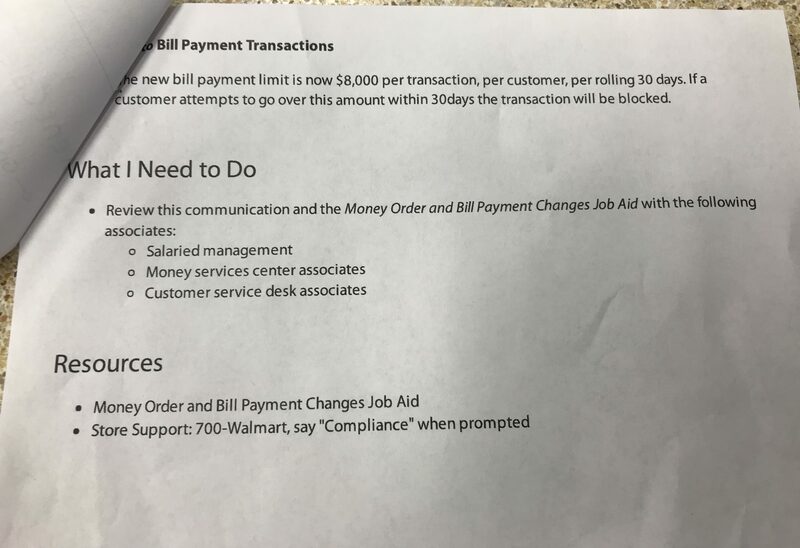 Also, while Walmart’s memo lists $8,000 a maximum amount of money orders to be purchased in a day per customer, it seems to be enforced every 24 hours, not per day. Yesterday, I purchased $8k worth of money orders at several stores locally and this morning was turned away from a store citing “the customer has reached the daily limit for money order purchases” as a software prompted reason for the decline. 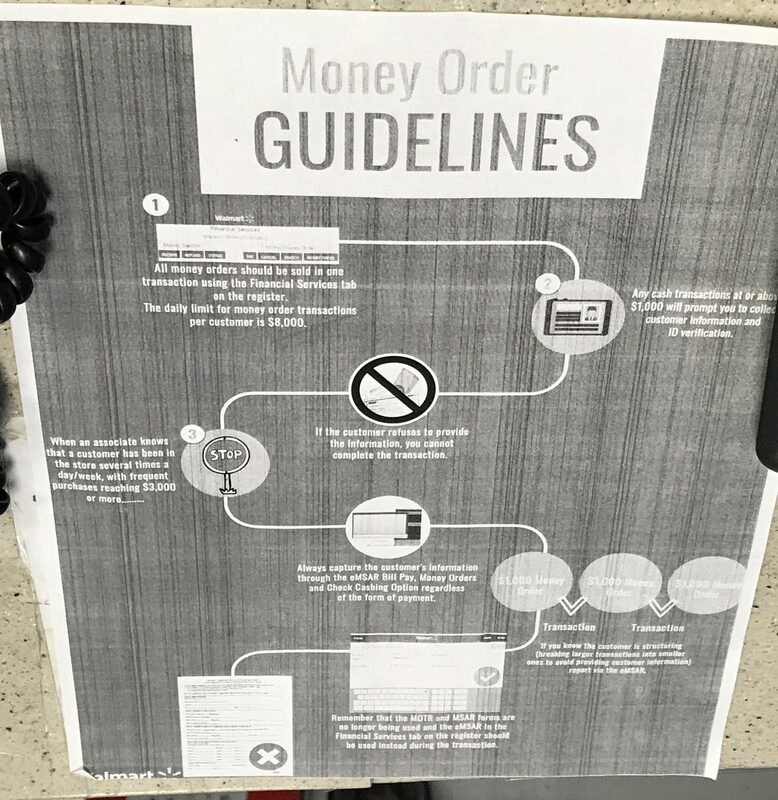 Currently when a customer asks for any money order over $1,000, the MoneyCenter service representative is prompted via software to enter the customer’s information into Walmart’s “Know Your Customer” (KYC) database. That information is used to record the transaction and hard codes the system to not allow a customer to purchase more than $8,000 in money orders, via cash or debit, in a “single day”. The KYC database is different from a Suspicious Activity Report (SAR or eMSAR), which details suspicious activity (such as a large cash transaction, etc.) 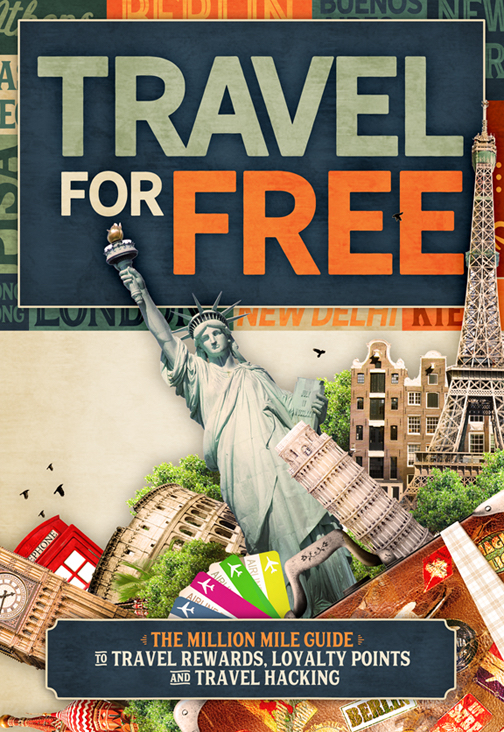 and does not require a customer’s social security number (SSN). In short, when thinking about the difference between the two types of customer data entry forms, know that the SAR prompts customers to enter a SSN and is basically actionable information. I’m not sure what Walmart plans to do with information in the KYC system, but information in a SAR could, and probably is, being shared with authorities who actively look for money laundering or other criminal activities. 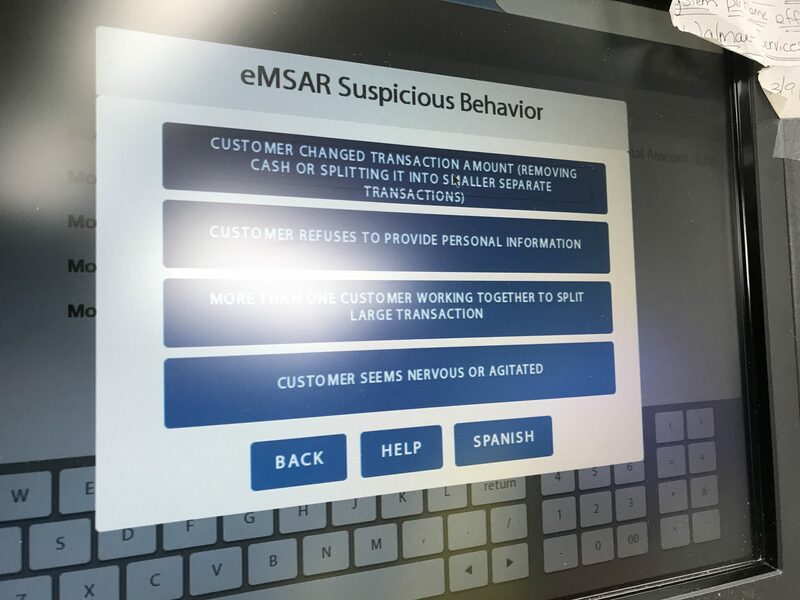 The KYC database currently being used seems to be in conflict with another memo that I saw in a local store last week that states that a SAR (Suspicious Activity Report) will be used for money order amounts over $1,000. An additional store that I visited yesterday tried to run an eMSAR for a simple $2k money order transaction, and not a KYC input. When I realized this, I simply turned around and walked out. With a typical gift (debit) card transaction expense at around 1% (or higher), increased costs have made it prohibitive for some as a way to accrue credit card reward points en masse. Now for many others and with these new restrictions in place, time is the new prohibition. If people are running around from Walmart store to store and doing $2k or less transactions, it’s going to take a ton of time to manufacture points at Walmart. The exception to new $8k per day rule is doing a single money orders of $1,000 or less (to avoid the KYC/eMSAR forms), however doing those kinds of amounts are an even bigger time drain because doing so will likely require many more store visits for any scalable volume. Also, even though customers are still permitted $8k in money order transactions at Walmart every 24 hours, keeping track of that schedule for the sake of rewards points just adds to the annoyance that most people could do without. MS isn’t dead, but it’s certainly taken a massive beating, and then maybe set on fire afterwards. There are still some unanswered questions, but these new restrictions from Walmart and Moneygram are (or could be) the final nail in the MS coffin for many people. The main question for many people engaging in manufactured spend at Walmart is what is your time worth? Is taking hours each day (or multiple times a week) worth the points that you’ll earn by doing so? For most people, the grind probably isn’t worth it. Even if you believe it is, what is the real cost of the points that you’ve just accumulated, and how much hassle have you dealt with in order to accrue them? Other ventures like gift card or product reselling might be more attractive for those who want to earn points at higher rates. Certainly for meeting minimum spend, and for deals that involve money order transactions under $1,000, MS within Walmart is still quite viable. But for large scale and consistent MS, the current state within Walmart is quite grim.